This is a recipe for good old fashioned creamy scalloped potatoes. 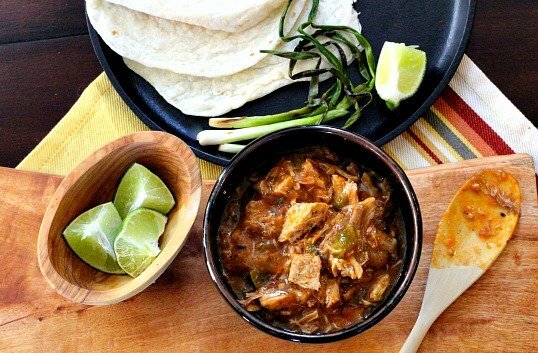 Simple ingredients and big on flavor. A tried and true recipe where scalloped potatoes taste pure, creamy and very special. Irresistibly delicious. Sometimes you just have to go on faith that, when it comes to a Creamy Scalloped Potatoes, less is better. I’m not sure when I fell in with a bad crowd, probably sometime in the 70’s. I was lured into making a glorified pan of potatoes that included cream of this and cream of that soup, more than a cup of greasy shredded cheese and voila, I was serving up a monstrosity of a potato casserole. That’s certainly not how my mom made them. Hers were a much simpler offering. Thin sliced potatoes and onions simmered in a cream sauce with a little sprinkle of paprika for color…bingo. It’s perfect, a classic, its creamy, it’s decadent and a sure crowd pleaser. Of course Mom didn’t use a recipe and I remember when I first started cooking, it was difficult to get the combination right for a perfect pan of scalloped potatoes. When I saw this recipe come over from Saveur, I had to give it a try. It’s spot on. If you have a mandolin, get it out for this recipe. Evenly sliced thin potatoes make this melt in your mouth even creamier. worked just fine, and with its smaller size would be easier to store. $18. 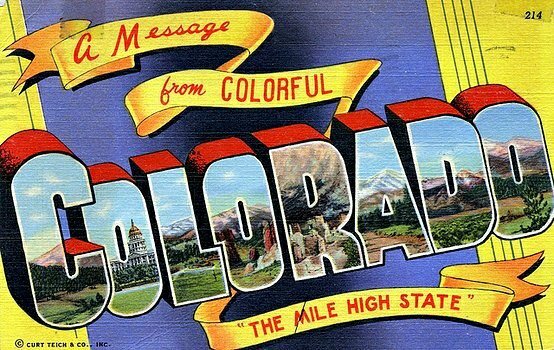 you see in the photo above. It protects your hands from cuts and guiding the food with your palm makes mandolin use much more manageable. I’m slicing fibrous jicama in the photo for a Jicama and Orange Salad. When pressing hard to get that jicama to slice well, that glove worked like a charm and with no worry about slicing my hand in the process. I love this glove. How do you make creamy scalloped potatoes even creamer? 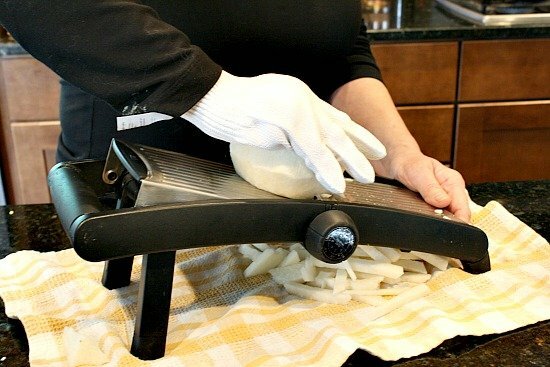 Evenly sliced potatoes will cook more consistently … use a mandolin. Heavy whipping cream. Don’t try to skimp on fat calories and use half and half. The fat content in cream simply cooks better and doesn’t separate like milk or half and half. In addition, when the potatoes cook, they will release some moisture into the cream. Better to have that moisture mix with thick luscious cream for a beautiful thick sauce. Use Yukon Gold Potatoes. I find them creamier. Now for this killer recipe, it’s the best scalloped potatoes recipe I’ve found. Enjoy! 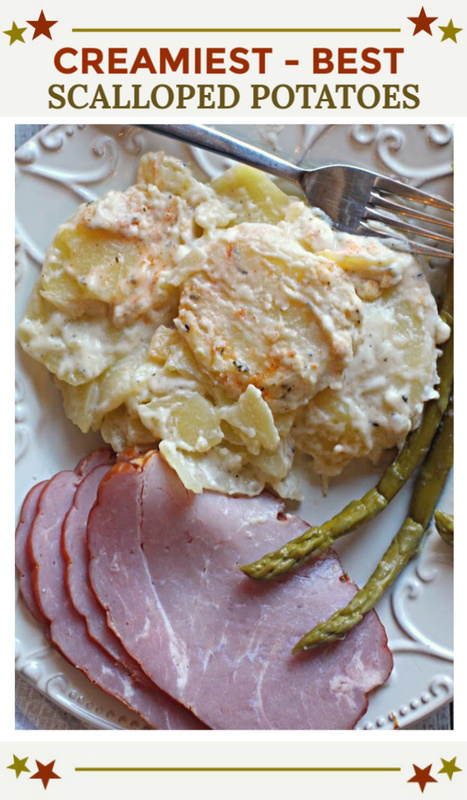 I hope you give this creamy scalloped potatoes recipe a try. And if you do, please come back and give the recipe a star rating. And leave a comment about your experience with the recipe. And if you have a favorite creamy scalloped potatoes recipe, let me know, I’d love to give it a try. 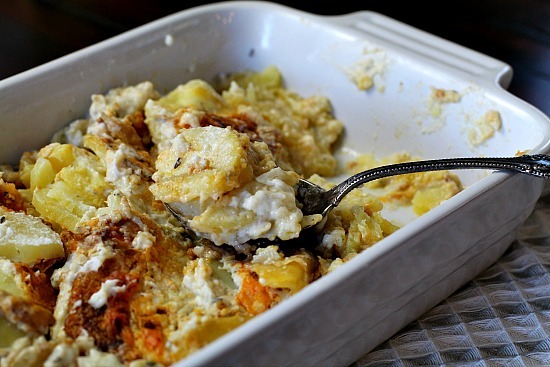 Old Fashioned Creamy Scalloped Potatoes Casserole …It’s what’s for a Side Dish. 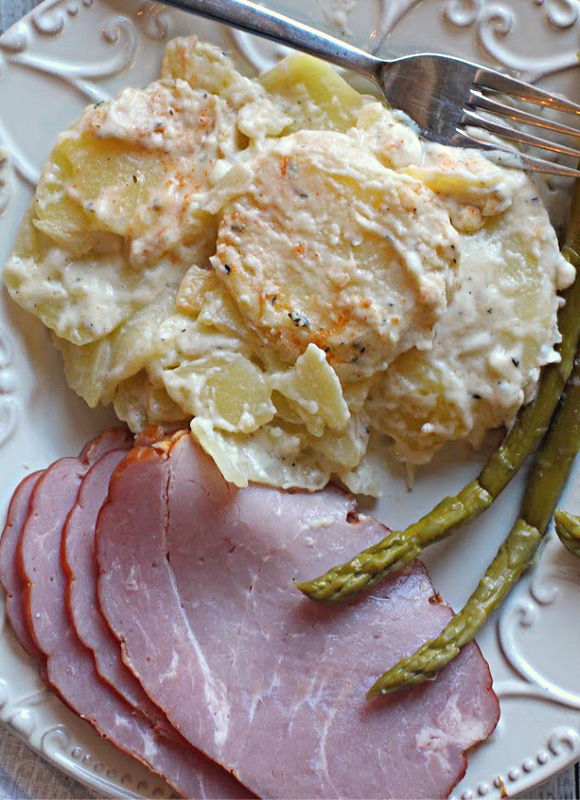 And of course no self respecting spoon full of scalloped potatoes would not be served without a slice of ham and a spear or two of asparagus. Take a look at this Honey and Thyme Glazed Ham Recipe. Always good to hear from you Sue. I’ve never had them out of a box, but I had my fill of mac and cheese from that blue box. Good stuff. I wish I had a big ol bowl of scalloped potatoes for breakfast! Lea Ann, with a gorgeous potato dish like that, I don’t need anything else. Meat and potatoes? Hold the meat! We just love scalloped potatoes and yours look very good. Thank you Larry – we love scalloped potatoes too. 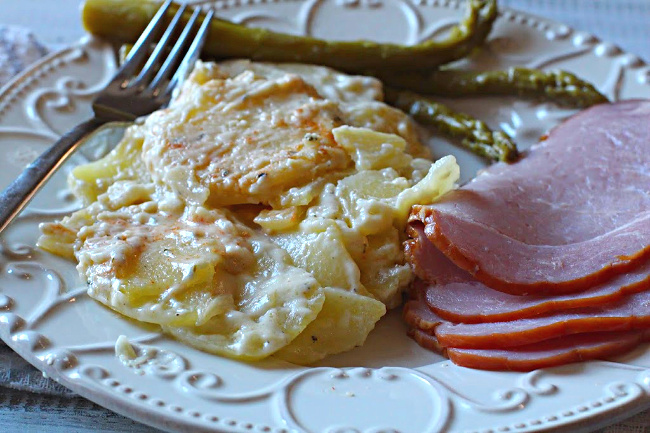 Tis the season for ham and scalloped potatoes. Hi Lea Ann, love potatoes prepared any way. This looks delicious, what a great classic dish. 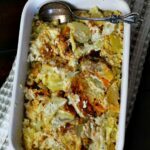 I love scalloped potatoes and thanks so much for the reminder as I have not made these for such a long time. Loving the photo of you using your mandolin with the glove. I am sure you have heard about my dreaded mandolin incident. One cannot be too careful!. Have a super weekend. I haven’t had scalloped potatoes in years. Your meal would be a delicious one for Easter. These potatoes are my idea of comfort food. I’d eat them alone for my meal– nothing else needed even though that ham is gorgeous. 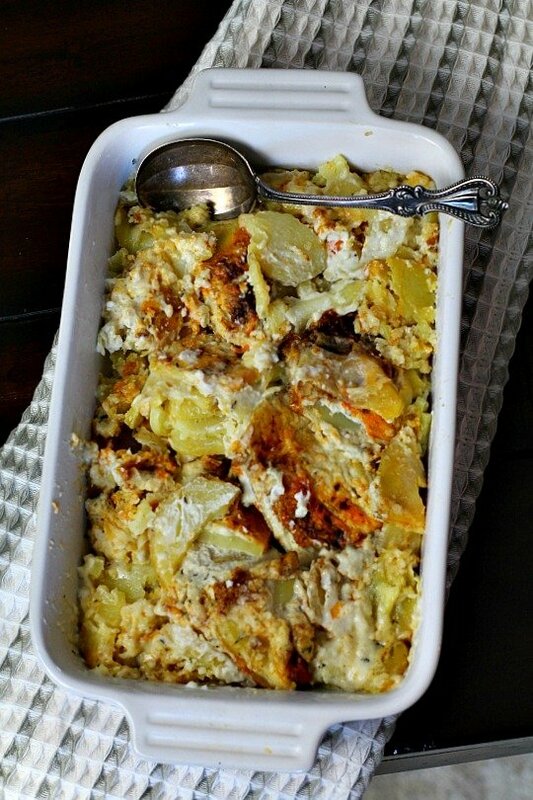 One of my fondest memories was that after Easter my mother would make scalloped potatoes. She would layer left-over ham slices in between the potatoes and onions and it was thickened with just flour and milk with very little salt. So simple and so good. I love the sound of this recipe with the thyme. Well, I’ve got to eat soon – I’m salivating. Bob loves scalloped potatoes, and I’ve made them recently. My recipe mimics yours, but I do put some shredded sharp cheddar in the sauce. If we have leftover, we wrap them into a breakfast burrito. My mom always made this too, usually when we had ham. I’m definitely giving it a try this weekend. Scalloped potatoes are just the best. Thank you,thank you,thank you. My mom made scalloped potatoes exactly this way,and they were always so delicious. Most all recipes today include some type of cheese…. Those are au gratin potatoes,not true scalloped potatoes. Now-I have to go make some potatoes.